The phrase, 'as meek as a mouse', underlines our attitude towards these fascinating little creatures; we think that they are small, weak, and in dire need of our protection. In reality, mice are a witty warriors and shrewd survivalists. These animals are extremely adaptive and have learned to thrive in all environments and circumstances. Their boundless libido and short reproductive cycles have allowed mice to colonize every continent easily, thus giving them a reputation of being very fertile. The late King of Pop, Michael Jackson, achieved chart topping success with a song about a pet mouse called Ben. Despite the negative stigma, many persons view mice as loyal companions. Unfortunately, this leads to mouse owners being labelled as outcasts in society. This is because people often confuse rats and mice, leading to the false assumption that all related animals should be condemned. In fact, mice make great companions for children and the public brouhaha over their suitability as pets is generally unwarranted. Mice also have a role in religion. Mushika the mouse (also known as Ulaka the rat) is the vahana for the Hindu god, Ganesh. Much like the symbiotic relationship between a cowboy and his horse, Ganesh and Mushika are able to master the most difficult challenges and penetrate the smallest spaces. In essence Ganesh is an 'All Seeing God', since he can go everywhere and observe everything. Over the years, mice and their cousins, the Rats, have been given a bad reputation, but if we took the time to learn more, we'd easily see that these animals are truly amazing creatures. Whether you can remember the opening of Walt Disney World or are still too young to remember life before the iPhone, the most famous of mouse, by far, is certainly Mickey Mouse. 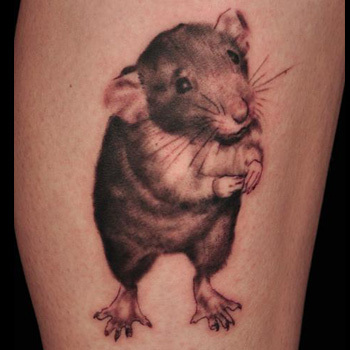 A Cartoon Mouse Tattoo expresses to the world your perspective about your persona. Mice are clever, fun, friendly, curious, and extremely loyal, just like you! Of course, imagine how boring Mickey's life would be without Minnie? If you are a woman, a Minnie Mouse (or any mouse tattoo) is a great way to show off a demure demeanour. You are perceivably innocent and meek with big floppy ears and shimmering eyes, yet your alluring pose and womanly curves are unforgettable. Cartoon Mouse Tattoos allow you to be fun and flirty at the same time. Most tribal patterns across the globe represent a spiritual bond between the natural elements and the people who are indigenous to the region from whence the patterns originate. Although a mouse doesn't have strong associations with the spiritual realm, it is a creature with deep connections to the Earth and the natural elements. Mice seek shelter and food from the Earth, so a Tribal Mouse Tattoo shows your dependence on the elements of Nature and your connection to a particular culture or the spirituality. There's much more to the little mouse than meets the eye, so when choosing the right tattoo design, it is important to pay special attention to what these wonderful little creatures symbolize in your life. Make the artwork fun and exciting, just like the mouse, by adding interesting elements and vibrant colours.If you need inspiration, our team of artists would be more than happy to help. Simply visit our design page at www.itattoodesigns.com and take advantage of our Custom Design Service.